I almost got ahead of myself and said that this was about 2017. This is the worst time of year for me in the pharmacy. We’re pulling medications that expire in early 2017 off of the shelves. So I will be dating everything 2017 until this time in 2017, when I will suddenly decide that it’s 2018. So, the morning of our third day in Chicago, Alex and I got up and stopped by another couple of notable buildings, this time the Sears Tower and the Chicago Board of Trade building. We went into the Sears Tower so that Alex could see “The Universe,” the Calder mobile in the lobby (which, at first, he misheard as “Caldermobile,” like Batmobile, but for Alexander Calder, I guess). 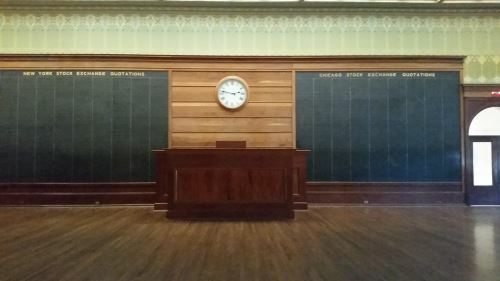 We went to the Board of Trade building because, well, it’s the Board of Trade building. After this, we walked to the Ogilvie Transportation Center, where we caught the next train to Glencoe. On the way, we passed the Morton Salt storage facility that has had a wall collapse two times. Google seems to think that the first collapse was in 1989, but I can’t find anything specific about that collapse. The second one (in 2014), however, was big news. You see, in the intervening 15 years, a car dealership moved in next door and they had parking spots right up against that wall. So, yeah. The cars that had been parked there ended up covered in bricks and salt. 11 cars were damaged in the wall collapse. I told Alex this whole story as we went past. The building is hard to miss. It says, “MORTON SALT” on the roof. When we got to the Braeside station, it was a one-mile walk to the gardens. There is a pedestrian entrance to the garden that is lovely. Much nicer than the parking lot. We stopped in the visitor’s center and stopped in the cafeteria for a snack. Then we hit the garden. They’ve added a few things in the six years since we were last there. I think that the Regenstein Fruit and Vegetable Garden was new. Also I think that there is more to the Dixon Prairie than there was last time. Otherwise, though, it was pretty much the same lovely garden as usual. There were only two negatives. One was apparently they had just done something — spread manure, maybe? — under the trees, and the smell burned our sinuses. As a result we had to avoid the trees. And then, possibly because we were avoiding the trees, it was hot. Like, really hot. Like, almost Texas hot. As a result, we left an hour or two earlier than we’d originally planned. We got most of the gardens in during the almost three hours we spent in the garden, tough. Then we slogged back through the heat to the Braeside train station. While we were on the train back to Chicago, I texted a friend that we had planned to meet to let him know that we were going to be a lot earlier than we’d expected to be. We met our friend by the Michigan Avenue bridge (one of my favorite places in the city) and he showed us around his work. 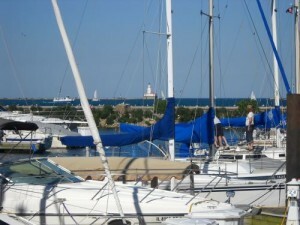 Then the three of us headed for Navy Pier, where Alex and I had plans to see the fireworks. We got dinner from the food court at Navy Pier. Alex and our friend got hot dogs, I got the strange combination of an Italian beef sandwich and a Greek salad (They were delicious, by the way). Our friend had to head home soon after dinner, so Alex and I found a seat for watching the fireworks. It turns out we weren’t quite in the perfect spot for the fireworks, so we moved a little closer and I got some pictures of the fireworks. Then, as everyone else on the pier headed home, we walked farther onto the pier. We walked to the end of the pier and watched the beacon from Chicago Harbor Light for a while. Then I took a picture of Alex on the couch of Bob Hartley, Bob Newhart’s character from the 1970s Bob Newhart Show. I also took a picture of an insomniac seagull that Google photos thought was a picture of the moon. we walked back down the back side of the pier, where there were fewer other people and the lighting was more subdued. I got some lovely pictures of the pier back there, and we continued on to the bus back to our hotel. We checked with the driver to make sure we were on the right bus, and then we completely missed our stop. 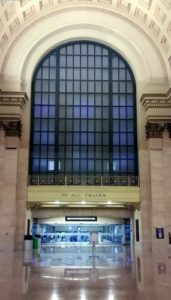 We ended up at Union Station, which I had been wanting to visit anyhow. 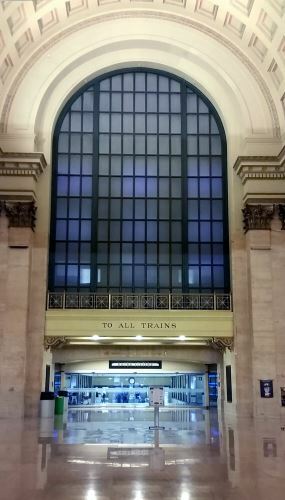 So I took Alex into the station and pointed out the corner where Zod threatens the family in Man of Steel (I find violent scenes in movies to be really boring, so I spent those scenes in Man of Steel trying to identify buildings, because I was pretty sure that they were using Chicago as Metropolis. Once they arrived at Union Station, I was certain that they were using Chicago as Metropolis). At some point on the walk back to our hotel, S Health let me know that I had set a new step record that day. This really did not surprise me a bit. My previous record had been 12.25 miles on the day we visited the Statue of Liberty and Ellis Island. This day, my new record was 14.37 miles. It may be a long time before I beat that one. We got up early and hit the complimentary breakfast, which was lackluster. The “scrambled eggs” tasted like those cholesterol-free artificial eggs, judging by the overwhelming onion flavor that they had. I’m not a big fan of onions, so that was disappointing. Then we hit the road. Our first stop was the Harold Washington Library, which I, personally, love. Yeah, I can see the disenchantment with the big verdigris structures on top, but I love the rest of the red granite exterior and the inside is lovely. I also have a sentimental connection to the building. They were putting the finishing touches on it during my time working in the Loop and I walked past the construction site nearly daily. 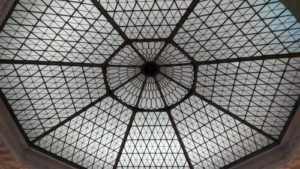 My folks and I also went on one of the official tours when the library officially opened, but I don’t recall ever visiting the winter garden on the top floor. So, Alex and I took the escalators all the way up and then all the way back down again. I have to admit that I slipped my shoes off in the winter garden because they were just the tiniest bit squeaky and the silence up there made the squeakiness really loud. 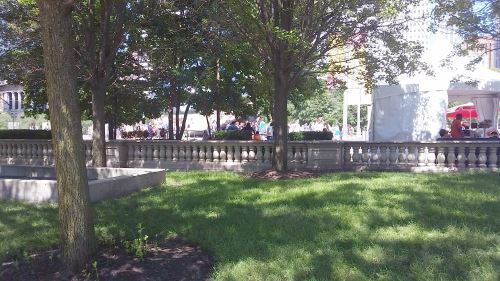 After we left the Harold Washington Library, we continued eastward on Van Buren and into Grant Park. We passed the statue of Lincoln and then headed for Buckingham Fountain. From there, we went on to the Field Museum of Natural History. While in the Field Museum, we visited all of my favorite exhibits: Ancient Egypt, the gemstone and jade halls, the taxidermied Lions of Tsavo, and, of course, the dinosaurs. 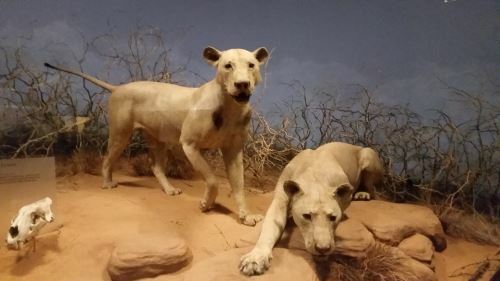 They have modified that section of the museum since the last time I was there, focusing on the eras in which the different animals on display went extinct. They also have the old Charles R. Knight paintings in the same rooms with their respective eras. I love those old paintings, even though they’re a bit out of date by today’s scientific standards. Isn’t it interesting that two of the artists whose work I’ve loved since I was a child — Monet and Knight — both had visual impairments? I have always been extremely nearsighted, so perhaps something about their work feels sort of “homey” or something. We also found that the meteorites, which had been removed from display for decades, if I recall correctly, were back on display. It was lovely seeing them again. We headed from there to the Adler Planetarium (writeup to follow someday). 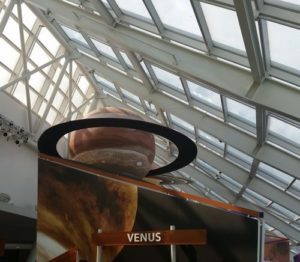 I hadn’t been to the planetarium in years. Since the last time I was there, they added a whole glassed-in section, and, I think, at least one sublevel. So Alex and I spent quite a bit of time there. We were constrained by time and finances, so we had to pick just one show to see, which ended up being in just a regular auditorium, rather than being in the big dome. I have promised Alex that we’ll do another planetarium sometime soon so that we can get the dome show in. After that we went to the Shedd Aquarium (which I also have yet to write up). We got the most basic admission, which only lets you in to see the fish and other animals on the main level. But that ended up being enough. I also love the building itself. The attention to detail in the doorways and things makes just walking around the building an enjoyable experience. I had planned to take Alex to Aurelio’s Pizza* in Homewood. While we were looking up train schedules, I stumbled across the information that there is (or perhaps was, for those of you reading this in the future) an Aurelio’s in the South Loop, almost on the doorstep of the Museum Campus. As it was around 5:00 by then, we sat down for a while before heading off for pizza. I got some pictures of the museums without crowds around them while we enjoyed the early evening. I had hoped to make it to the park on Northerly Island (which used to be the Meigs Field airport), but, again, it was 5:00 by this time and we were exhausted. We had our pizza and then headed back towards our hotel. 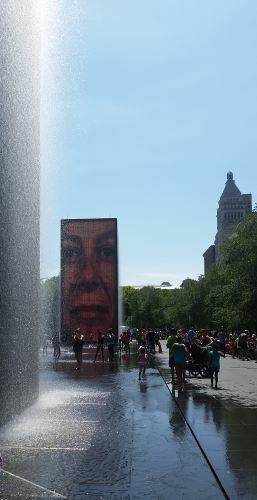 On the way up Michigan Avenue, I happened to notice the Rosenberg Fountain, which may be the oldest piece of public art in Grant Park (I’m not sure if the fountain or the Art Institute lions are older). So I made Alex stop so that I could take pictures. One thing led to another and we ended up walking back north through the park while I took pictures of the art. Then we hiked back to our hotel and got some rest for what would turn out to be a record-setting day of walking on our third day in Chicago. *I hardly ever mention the names of businesses in these writeups, but I figured that this would be far more complicated if I tried to talk around the name of the restaurant rather than just naming it outright. 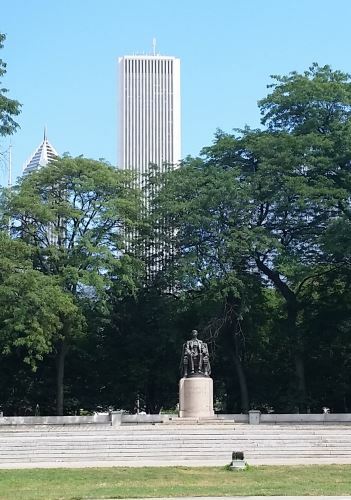 When we left Chicago, I was wondering if I got any decent pictures of Lincoln Park. As it turned out, the only pictures of the park that weren’t of the zoo that I got, as it turned out, were one picture of the Couch mausoleum that I took from a moving bus (so it’s not the best picture ever), a few pictures of the Albert Caldwell Lily Pool, and a couple of pictures of the beach just a little south of where Lake Shore Drive would intersect with Belden Avenue if Belden Avenue went through. Which it doesn’t. Anyway, I haven’t found anything that I liked well enough to showcase in my post on Lincoln Park, so on to the zoo. I have 47 pictures from the zoo, so I’m sure that I can find something that I can work with there. Lincoln Park Zoo began, for all intents and purposes, with two swans in 1868. In 1874, a bear cub joined the swans, and the zoo was underway. I’m not sure when exactly the “there are two swans and a bear cub in Lincoln Park” gave way to a formal “Lincoln Park Zoo,” but the first zoo director, Cyrus DeVry, was hired in 1888, so it’s likely to have been somewhere in that period. Over time, the zoo grew, with the addition of new buildings and species. Today, there are over 1,000 specimens of over 200 species in the zoo. At the moment (and for the foreseeable future), Lincoln Park Zoo is free to the public. I don’t normally talk about admissions fees because that’s not “evergreen.” Someday the admissions cost will go up which means that one of two things would have to happen. 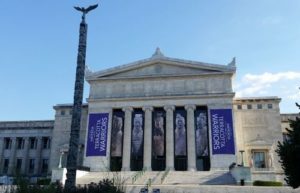 One, I would have to track the cost of admission to absolutely everything that I’ll ever write about that has an admission fee (the Art Institute of Chicago, the San Antonio Zoo, the Empire State Building, the Ruins of Pompeii) and then keep those pages updated. Two, I would have to resign myself to having out-of-date information on my page. And, honestly, this is what would be more likely to happen. I’m making an exception to the above rule in this case because not having an admission charge is highly unusual. There are 142 accredited zoos in the United States and of those, from what I can tell, fewer than ten have no admission fee. In the case of Lincoln Park Zoo, the money to run the zoo is largely covered by the fee for parking in the lots near the zoo and the sale of food and souvenirs. They take donations as well, and I threw a few dollars in that bucket while I was there. Any shortfall beyond that is covered by the city. The parking lot, by the way, is not a “throw a quarter in the meter” type parking. It costs roughly the same as any private parking lot in a big city. Therefore it’s more cost-effective to drive if you have several people in the car with you. On this visit, we didn’t drive; we didn’t have a car available to us. We took the bus. As one would imagine from the location, Lincoln Park Zoo is a lovely, parklike zoo, with lots of greenery. It’s a nice place to do some walking and watch the people and the animals. There is food available at the zoo, the most prominent of which (at least it’s the only one that stood out to me) is the food court at the Park Place Café. This food court has been there since Alex was maybe three, so it’s likely to turn out to be a long-term fixture at the zoo. As to the animals, well, there are animals at the zoo. I think that the western lowland gorillas made the biggest impression on me. This is at least in part to the fact that a silverback was leaning up against the join between two windows when we were there, allowing me to get several really lovely pictures of him. Of course, gorillas and Lincoln Park Zoo have had a long association. In 1930, the zoo acquired a gorilla named Bushman. Bushman lived for another 21 years at the zoo, and during my childhood, most of the adults in my life had fond memories of him. 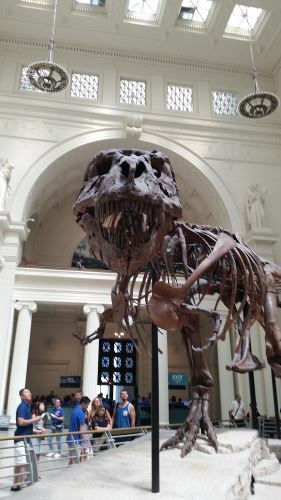 He was taxidermied and is on display at the Field Museum of Natural History. I think this will end up being three parts. Next up, Grant Park and the Art Institute of Chicago. On our first full day in Chicago, we walked to the Museum Campus up the Lake Shore Drive side of Grant Park and then back down the Michigan Avenue side after dinner (actually, we hadn’t planned to revisit Grant Park, but more on that when I do my blow-by-blow account of the actual trip). I thought about cropping this so that we’re closer to Lincoln, but I like the AON Center (formerly known as the Standard Oil Building) and Two Prudential Plaza so much that I left it this way. This is cropped, however. The original photo was taken from so far away that you can see the pillars on either side of the statue. I took a picture of the Chicago skyline from near Buckingham Fountain (my favorite photo of which is on my Tumblr), but I cannot find a good way to post it without weird diagonal lines on Mid-Continental Plaza. I’ll continue working on this problem. Or maybe I’ll just give up. Anyway, on our way back through Grant Park, I got a picture of what may be the oldest piece of public art in the park, the Joseph Rosenberg Fountain. Rosenberg got his start as a newsboy and was never (or seldom, at least) able to find someone willing to give him a drink. 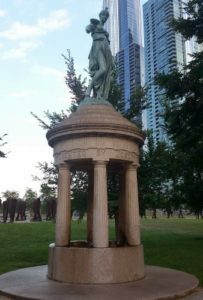 So in his will, he left money to the city to put a fountain where people could get free water. The fountain still works, but the water is non-potable. Another photograph that I’m wrestling with was of The Bowman, one of the two statues of Native Americans on horses that stand at Michigan Avenue and Congress Parkway. It was getting pretty late by the time we walked through Grant Park and the picture is pretty badly backlit. It is, however, the closest I’ve ever been to either statue, so I’d like to share it once I get the kinks worked out. One of the first places we visited (just after the Marshall Field & Co. Building, the Chicago Cultural Center, and Millennium Park) was the Art Institute of Chicago. 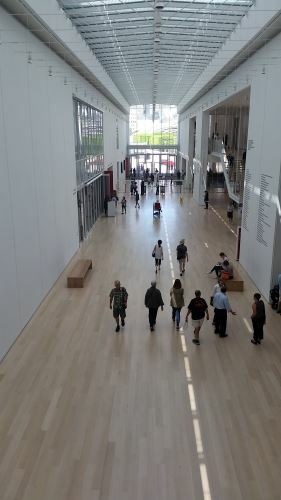 I’ve been going to the Art Institute of Chicago for decades. When I was 14 or so, my parents joined the museum, giving us basically unlimited visits for free, so we could just kind of arrive whenever and leave whenever without a lot of pressure to “get our money’s worth.” So, while I was a little rusty on this visit, I once pretty much knew the museum like the back of my hand. 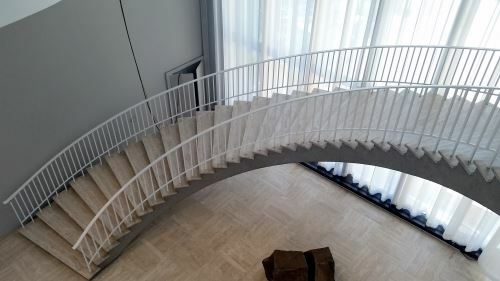 Ever since I was very, very little, I’ve had memories of my parents and me in a museum that had art and also had a spiral staircase with a large window behind it. I seem to recall that there was a statue of a mushroom in the center of the staircase. I thought for years that it was a very odd dream until we visited for the first time in years, when I was about ten or so, and I found the staircase. I still have no idea about the mushroom. I took a lot of pictures of some of my favorite, and some of the most notable, artworks in the museum’s collections, but those are mostly for my own amusement and for me to look back at them and go, “I remember that trip.” American Gothic had been removed from its customary location in favor of being in a special exhibition on art in the Great Depression, which cost extra money. I saw it through the exit door of the exhibition and took a picture, just for the entertainment value. I’m playing around with it in Paint.Net and if I ever get something usable, I’ll let you know. This may be the final installment or, as I said above, there may be one more. I need to go through my pictures from our final day in Chicago and see if I got any good pictures of Lincoln Park that were of the park itself and not of Lincoln Park Zoo. It was really, really warm that day and we were meeting a friend for lunch, so we didn’t have a whole lot of time to explore Lincoln Park. It was pretty much visit the zoo, take pictures of the lake, and then get on the bus and get to our lunch meeting. One way or another, we’ll be back in Chicago on or about October 1, I think. If not then, then October 5 for certain. Probably. We actually got back late Thursday night, but I had to (a) pick my cat up from boarding early yesterday and (b) work until pretty late last night, so this is the first time I’ve had it together enough to post. 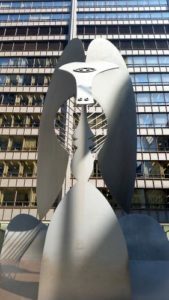 What I noticed about this photo of the Picasso, for what it’s worth, is how low my perspective is. I mean, I know that I’m short, but somehow I always imagined that I was seeing the Picasso from something like the same angle that it’s usually photographed in, and not from an angle where I would be looking up her nostrils if her nose were three-dimensional (and “her” is correct — the Picasso is, in fact, a sculpture of a woman). We spent most of the time in downtown Chicago on this trip, but we did go out into the suburbs once, to visit the Chicago Botanic Garden in Glencoe. The trip was only four days, but we visited four museums (the Art Institute of Chicago, the Field Museum, the Adler Planetarium, and the Shedd Aquarium) and three parks (Millennium Park, Grant Park (which we actually visited in two chunks — we walked down the east side of Columbus Drive on our way to the Museum Campus and back up the west side of Columbus Drive on our way back to our hotel), and Lincoln Park (while we were there, we visited Lincoln Park Zoo). I also dragged Alex to some landmark buildings, including but not limited to the Marshall Field and Company Building (which currently houses a Macy’s), the Chicago Cultural Center, the Chicago Board of Trade building, and the Water Tower. I suggested that Alex and I go into Water Tower Place (a shopping mall across the street from the Water Tower), if only for the air conditioning, but he didn’t want to. I took over 600 photos and saw two childhood friends while I was there. It’d been six years since my last visit and I don’t want that much time to pass again. One of my friends and I almost didn’t recognize each other, it’d been so long since we’d seen each other. I’ve started a fund to save up for another trip back. I’m thinking that we may rent a car for part of the next trip (which looks like it’ll be late in 2018 or early in 2019) because I’d like to take Alex to see the Black Hawk statue in Lowden State Park and Grosse Point Lighthouse in Evanston, both of which would be much easier to visit with a car. I’m Supposed to Be Doing a Northern Illinois Destination Next . . . But I think I’m going to take a five-month hiatus on that topic. It seems weird to be talking about Chicago destinations right now (particularly since almost all of my photographs of Chicago have disappeared down the rabbit hole) when I just booked a trip to Chicago for August. I haven’t been home in six years, so this will be nice. Chicago Harbor Light, 2010. Taken with my old Palm Treo phone, if I recall correctly. Monday: Fly into Chicago. Grant Park, Art Institute of Chicago, pizza. Tuesday: Museum Campus during the day and Navy Pier in the evening. Wednesday: Chicago Botanic Garden (Navy Pier if we fail to make it on Tuesday). Thursday: Lincoln Park Zoo, Lincoln Park, fly home. At some point, I want to visit some of my favorite architectural sights, including (but not limited to) the Chicago Cultural Center and The Store Formerly Known as Marshall Field’s. As I’ve said before, I haven’t spent that much time in Lincoln Park, personally. 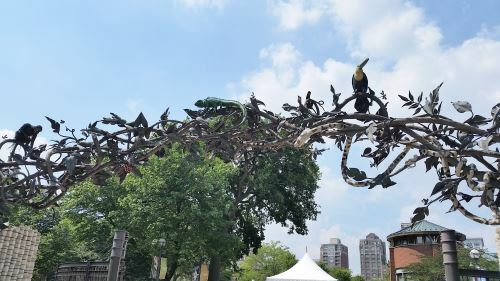 I think I’ve been to Lincoln Park Zoo maybe five times in my life (my family preferred Brookfield Zoo) and while I’ve driven past the park on Lake Shore Drive probably a dozen times or more, I haven’t spent much time in the park itself. While researching this post, I found one thing that was surprising. Lincoln Park is apparently 150% the size of Central Park. It probably wouldn’t take as long to explore, however, since, at seven miles in length, Lincoln Park is four times as long and, at 1500 feet wide, is only about half as wide. Lincoln Park is home to the Lincoln Park Zoo, the Chicago History Museum (formerly known as the Chicago Historical Society), the Peggy Notebaert Nature Museum, a conservatory (the plant kind, not the music kind) and the usual park amenities — sports fields, playgrounds, public art (including statues of Ulysses S. Grant and Abraham Lincoln), a field house, and things of that nature. The city website says, in part, “The Chicago Park District is committed to making its facilities accessible to and usable by all patrons and visitors. This commitment is ongoing, proactive and intended to meet the needs of a diversity of individuals with disabilities.” So the park itself should be wheelchair accessible. Much like Milam Park here in San Antonio, Lincoln Park is built on land that once was the city cemetery (there was also, like with Milam Park, a Catholic cemetery across the street). The story I was told was that they dug up the bodies (with the exception of the Couch family — their mausoleum is visible from LaSalle Street where it intersects with Stockton Drive). The truth is messier than that. The land that was chosen to become the city cemetery was, as so much of Chicago was at the time, swampy and disgusting. The residents worried that they might come down with cholera or something from the corpses stewing in the cemetery, so they started to agitate to have the cemetery removed. Some of the bodies were removed, but then the Great Chicago Fire hit. the fire spread as far north as Fullerton Avenue, which means that the land that had been the city cemetery was in the path of the fire. Many of the grave markers were wood and burned as a result. Near as I can tell, if no one came forward to say “Great-uncle Fred is buried here,” they just left the body there. Artist Pamela Bannos, in her Hidden Truths project, estimates that there are at likely thousands of bodies still left under the park.